In following LD's Baba's Day Proclamation we began the day with Seven's home-made-coffee in a mug chosen especially for me and a t-shirt from BioMom to match one of Bigs', then on to the farmer's market where we meandered and split a yummy roll, then on to meet the grandparents to honor the great lineage that began my lovely little family, then back home to spend some time playing, reading, resting and napping. We finished up the day with a little bbq with some friends. In my own dad's words, it was a great "all-round" day. 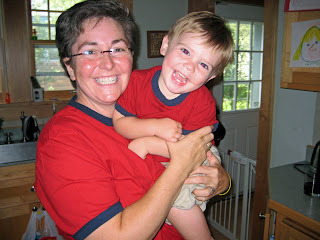 I *heart* the matching shirts! Thanks! Me too -- it was my favorite Baba's Day gift! I've been reading you for a year or so, and I had to delurk to say that is the cutest pic ever. You guys are adorable.